A local lad from Dalkeith, James Malarkie, served with the Tank Corps in WW1, he was driver of a tank in the 14th Battalion and in this letter home tells of his part in an action. He describes it in a very matter of fact manner, but this is his part in the Battle of Amiens, which started on 8th August 1918. The battle was launched with the aid of over 400 tanks. It petered out after a few days but was the start of the final 100 days advance of the allied armies. German casualties were massive and it’s known as the blackest day of the German Army. For the action described Pte. 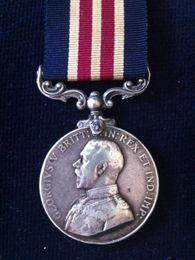 James William Malarkie (No.112296) was awarded the Military Medal. “For gallantry, determination, and devotion to duty during the advance from Villers-Bretonneux to Meharicourt on August 8 and 9. This man drove with great coolness and skill throughout these days. The citation gives his battalion as being No.14. The battalions were all identified by a sequential letter of the alphabet prior to the end of 1917 and, because of this, generally named their tanks with a name that started with their battalion letter. This practice continued after the battalions were numbered and the name “Newtongrange” fits in nicely with this convention. James’s brother was killed in 1914 whilst serving with the Scots Guards. Another brother Edward died of wounds in Italy, 1918. James was a miner at the Newbattle Colliery in Newtongrange. 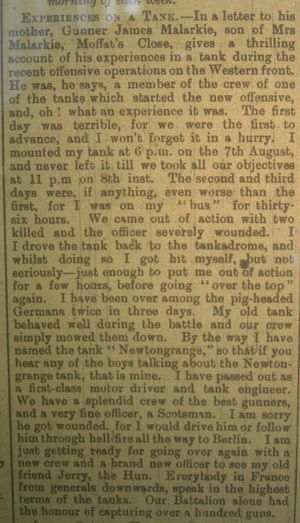 The tank commander of Newtongrange was Lt PCT Dewar on the 8th and 9th August, but he was not listed as killed or wounded. 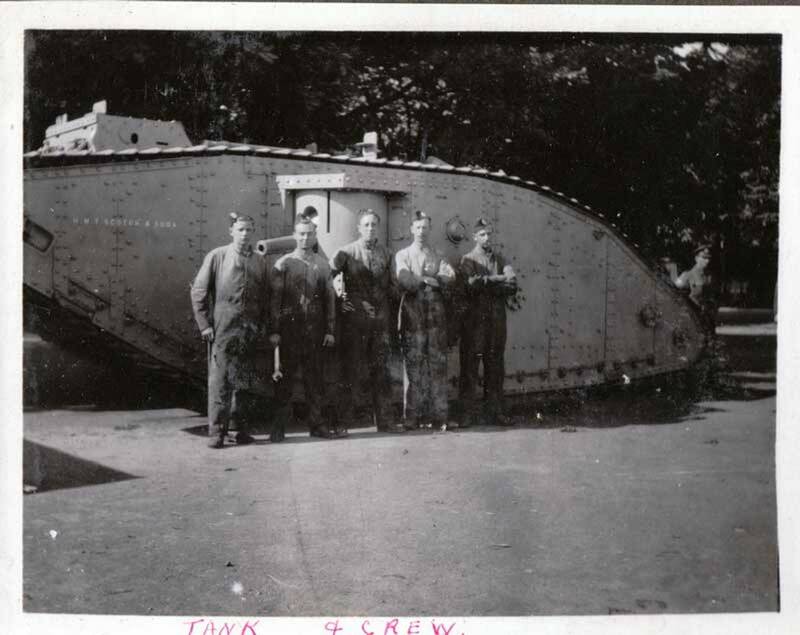 Newtongrange was tank no.9148 of B Company 14 Battalion. The B Company Commander Capt JFC Cameron was wounded on the 8th August, so I presume he was in this tank directing the battle and was wounded as Lt Dewar was still the tank commander on the 9th.